Until the middle of the last decade, dogs were believed largely immune to influenza A infection. All that changed when an equine H3N8 virus mutated enough to adapt to a canine host, and began to spread among greyhounds at a Florida race track in 2004 (see EID Journal article Influenza A Virus (H3N8) in Dogs with Respiratory Disease, Florida). Since then canine H3N8 has been sporadically reported across much of the United States. It is considered a `canine specific’ virus, and has not crossed back into horses. Additionally, there have been no reports of human infection. About the same time we began seeing reports of dogs infected with avian H5N1; first in Southeast Asia, and then in the Middle East (see Study: Dogs And H5N1). Over time other novel flu viruses would turn up in dogs, including H5N8, H6N1, and pdmH1N1. More significantly, in 2007 we saw an avian H3N2 virus jump to - and become endemic in - dogs in South Korea (see Transmission of Avian Influenza Virus (H3N2) to Dogs). In 2014, in Canine H3N2 Reassortant With pH1N1 Matrix Gene, we looked at a study that appeared in the journal Epidemiology & Infection, that found a new reassortment of the canine H3N2 virus – one that has picked up the M (matrix) gene from the 2009 H1N1 pandemic virus. 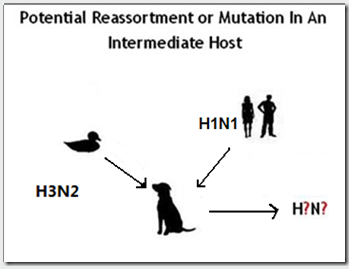 Last August, in J. Virology: Zoonotic Risk, Pathogenesis, and Transmission of Canine H3N2 we saw another study where researchers created and tested canine H3N2 - pdmH1N1 reassortants, and found some `may pose a moderate risk to public health and that the canine host should be monitored for emerging IAVs'. Whether through reassortment (see Study: Dogs As Potential `Mixing Vessels’ For Influenza), or via host adaptation of canine H3N2 (or H3N8), the potential for dogs to facilitate influenza evolution cannot be ignored. All of which brings us to a new study, published last week in Emerging Microbes and Infections, that looks at the continual evolution and mammalian adaptation of canine H3N2 in Korea between 2009 and 2013. It's a long and detailed open-access study, and so you'll want to follow the link and read the report in its entirety. The gist is, comparisons of the 2009 H3N2 virus to later versions showed signs of increased transmissibility (in ferrets) and increased pathogenicity (in dogs), indicating continual evolution and mammalian adaptation of canine H3N2 virus. Comparison of the virulence and transmissibility of canine H3N2 influenza viruses and characterization of their canine adaptation factors. Lee IW1, Kim YI1, Lim GJ1, Kwon HI1, Si YJ1, Park SJ1, Kim EH1, Kim SM1, Nguyen HD1, Song MS1, Choi YK2. Recent canine influenza outbreaks have raised concerns about the generation of pathogenic variants that may pose a threat to public health. Here, we examine avian-like H3N2 canine influenza viruses (CIVs) isolated from 2009 to 2013 in South Korea from dogs. Phylogenetic analysis revealed that these viruses are closely related to strains previously isolated from dogs in Korea and China. However, molecular characterization demonstrated non-synonymous mutations between the canine viruses, particularly in the putative H3 antigenic sites, NA stalk regions, and in the internal genes of the 2012-2013 isolates compared with the 2009 isolate. Animal experiments showed that three representative isolates (A/canine/Korea/AS-01/2009(AS-01/09), A/canine/Korea/AS-05/2012(AS-05/12) and A/canine/Korea/AS-11/2013(AS-11/13), were readily droplet transmitted between dogs, whereas AS-05/12 induced more severe clinical disease and was lethal in dogs compared with AS-01/09. Although all viruses were able to infect ferrets, AS-05/12 consistently yielded higher nasal wash titers and was transmissible to ferrets via airborne droplets. Using reverse genetics, we show that the NA, NP, and M genes of CIV are critical for the adaptation of avian H3N2 viruses, and the resulting reassortant genotypes promote viral growth in dogs in a manner similar to that of the wild-type AS-01/09 virus. Taken together, these results demonstrate that CIVs continuously evolve in dogs thereby allowing them to gain a foothold in mammalian hosts. Importantly, we elucidated the genetic contributions of the NA, NP, and M genes to the adaptability of CIVs derived from the avian H3N2 virus. Taken together, these results suggest that H3N2 CIVs have successfully adapted and established circulation in Korean canine populations. Furthermore, these viruses are continuously evolving in canine species and thus, are slowly gaining a foothold in mammalian hosts. Importantly, these results underscore the importance of continuous surveillance of CIVs, as it is possible that these viruses could acquire the ability to infect humans. While none of this is to suggest that canine influenza is on the verge of sparking the next pandemic, as the CDC notes in their Canine Flu FAQ, there are good reasons to watch viruses like these very closely.